Sam is straight bi-polar with narcissistic personality traits. Is there anybody with any credibility willing to defend these two Islamophobic Christian hate-preachers? It doesn’t seem so. Quite telling! Well let’s put it to another test in the form of Samuel Green. Samuel Green is a pastor. You’d think a pastor would not support the abuse and hate-preaching of Shamoun and Wood. Recently, Sam Shamoun upon reading this post for some inexplicable reason sent a group hate email directed to myself and his fellow Christian (Minoria). Amongst the addressees of this malicious email was pastor Samuel Green. 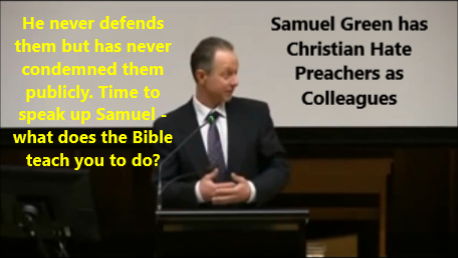 Now, I have spoken to pastor Samuel Green in the past and highlighted the anti-Christian actions of David Wood and Sam Shamoun. Guess what? Pastor Samuel Green has NEVER defended them. That’s quite telling, don’t you think? Pastor Samuel Green was witness to an email insulting myself and a Christian who goes by the name of Minoria. 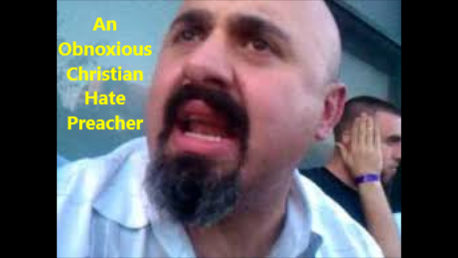 The email by Shamoun contained insults against Islam. I shall not reproduce the email but those interested can contact pastor Samuel Green to verify such a hate email was sent. I will allow pastor Samuel Green 5 days to decide whether he condones such emailing by David Wood and Sam Shamoun. From my experience with pastor Samuel Green his silence is quite deafening – whenever he cannot support something he remains silent. I predict silence. Christian Islamophobes, how do you get these folk to stop embarrassing themselves and their church? You stop giving them money! Surely you would rather give money to starving children in Africa than to a couple of internet Christian hate-preachers who don’t seem to have real jobs. Oh another thing, these two characters don’t even seem to be versed in Christianity so why in the world are Islamophobic Christians giving them money over starving children in Africa? Great Job brother Yahya, Sam is desperate asking for the attention, because his apologist career is dying and he knows that very well. He has no academic credentials, So he is so desperate for the spotlight. Leave him, Let his apologist career die. It’s ironic the bloke tries to use me to revive his career and grab a few crumbs of attention. 2/3/4 years ago (however long ago it was!) he was crying out for attention, he got it from me. The result? Well the result is a ton of videos disseminated over the internet showing him to be a dishonest, unscholarly and unworthy man – not to mention all those blog posts. And let’s not forget Shamoun promising to continue to spam my blog. A promise that he seems to be tiring from. Of course, I don’t for one minute expect Nabeel, Samuel or even James to come out and support the hate preaching and abuse by Dave and Sam. You’re all alone boys. Nobody with an ounce of rationalism, sincerity and knowledge of the Bible will support you per se. I call you away from Islamophobia. Think about it, when mental health professionals are opining that you may be ‘bi-polar’ you should recognise Isamophobia is doing nothing for your character development. Sure, you may have a few dollars in the bank account from the gullible and equally hateful Islamophobes on the net but are you really going to continue selling your characters and mental health for a few dollars? Get a job guys. Trust me, you feel better once you get out there with the rest of the normal folk. David Wood – self radicalised?